Summary: In Texas, tidal predictions do not meet the National Ocean Service acceptance criteria because factors other than tidal forcings often dominate water level changes (for example wind stress related forcings and wave climate). CBI has implemented / developed a set of models to predict water levels as an aid to navigation in the coastal waters of the Gulf of Mexico and as a tool for emergency management to predict coastal flooding. CBI provides tidal predictions, Persistence Model predictions and Artificial Neural Network Model predictions for the locations listed above. Persistent model predictions are quite accurate up to 6 to 12 hours but do not include predicted wind speeds and other broader information, i.e. they are not as accurate as ANN for longer prediction times. 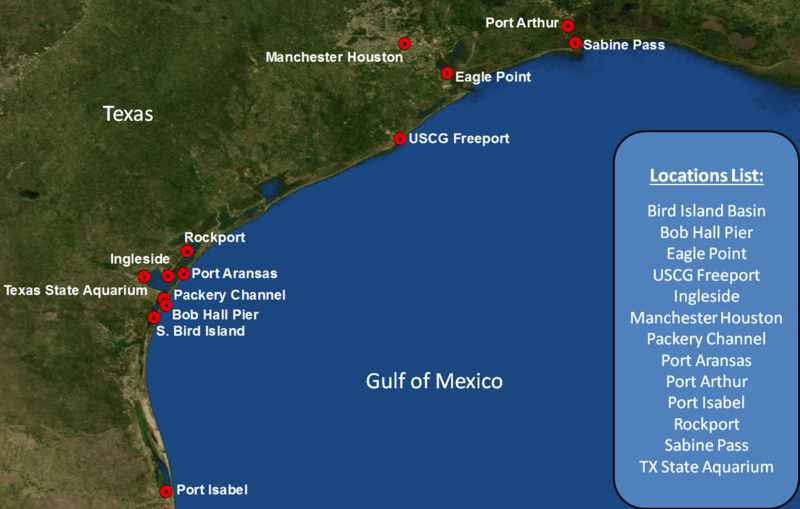 If you have further questions please email philippe.tissot@tamucc.edu Thank you to the sponsors who have made these predictions possible, including: Texas General Land Office, the NOAA Sea Grant and Sea Grant Technology programs, and the Texas Research Development Fund. NOTE (1): Predictions are generated on-the-fly. It may take a minute for the graphs to load. Please be patient. NOTE (2):Some of the functionality of the water level predictions was affected by changes in TCOON management and changes in format of NAM prediction deliveries. Efforts are underway to modify the system. Historical data, persistence model predictions and short term neural net predictions are typically not affected (except for a few stations where unrealistic big drops/spikes). Longer term neural net predictions, >12-24 hrs, are only based on measured winds and no longer wind predictions. System update is targeted for summer 2017 (sooner if funding is secured). The Galveston Pleasure Pier station (http://lighthouse.tamucc.edu/overview/021) was recently removed and replaced by the new Sentinel station installed along the North Jetty at the entrance of the Houston/Galveston ship channel (http://lighthouse.tamucc.edu/overview/529). Once sufficient data is available a model will be calibrated for this new station.